ST. GEORGE – Roadwork continues on state Route 9 through Springdale as a new phase in construction begins and motorists are advised to be prepared for increasing traffic delays during morning and evening commute periods. The following details are provided courtesy of the Town of Springdale. 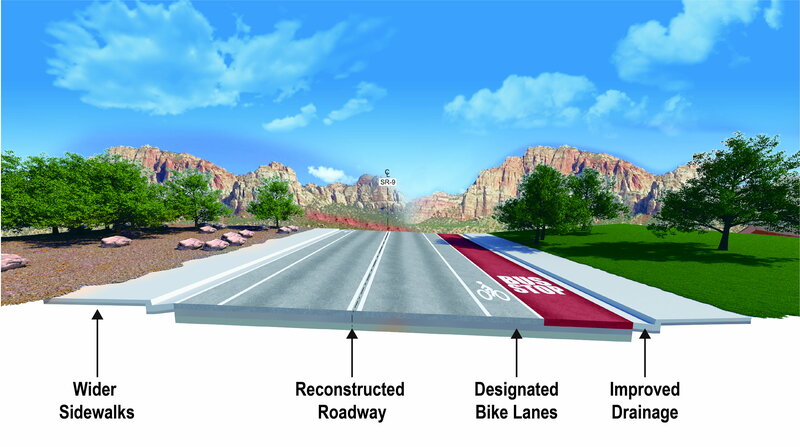 As a part of Phase 2 of the project, the section of road between the Driftwood Lodge and Desert Pearl Inn is currently being reconstructed and has been reduced to a single lane in both directions. Crews are removing the old roadway from Sol Foods to the Desert Pearl through early January 2018. Crews will be placing and finishing the road base from the Driftwood to Sol Foods in anticipation of asphalt paving Dec. 20-21. Crews will continue prepping and pouring curb, gutter and driveway approaches through December. These activities will require intermittent access interruptions of up to 4 hours while crews work in the accesses. Sidewalk removal and replacement in Phase 2 later this week through December. Precast wall installation is anticipated near Zion Canyon Village beginning Dec. 18 through early January 2018. Parts of SR-9’s Phase 1 area, between the Majestic View Lodge and the Driftwood Lodge, will be subject to intermittent single-lane closures during the day through December while remaining work activities are completed. Flaggers and temporary traffic signals are controlling the traffic flow. Motorists have been advised to anticipate delays of up to 25 minutes or longer. No work will take place on Christmas and New Year’s days. Springdale town officials advise residents and visitors that a great deal of utility work is being done as a part of the reconstruction and may result in service shut-downs. Springdale officials recently created a website where people can subscribe to a mailing list to receive news on utility shut-downs that can be found here. Water service interruptions on the south/west side of SR-9 between Porter’s and The Desert Pearl are planned for Monday night, Dec. 18 from approximately 8 p.m. to 7 a.m. on Tuesday, Dec. 19. Night work is scheduled to occur every night except Saturday. Expect an increase in nighttime noise from equipment, trucks and backup alarms. Work activities include paving, excavation, materials hauling and placement and utility work. Where will everybody park ? On both sides of the Zion canyon road like they do now, and also on both sides of the Carmel tunnel road from the Zion canyon junction up to the tunnel….massive chaos on a daily basis, except Christmas Day of course…Zion is lost.